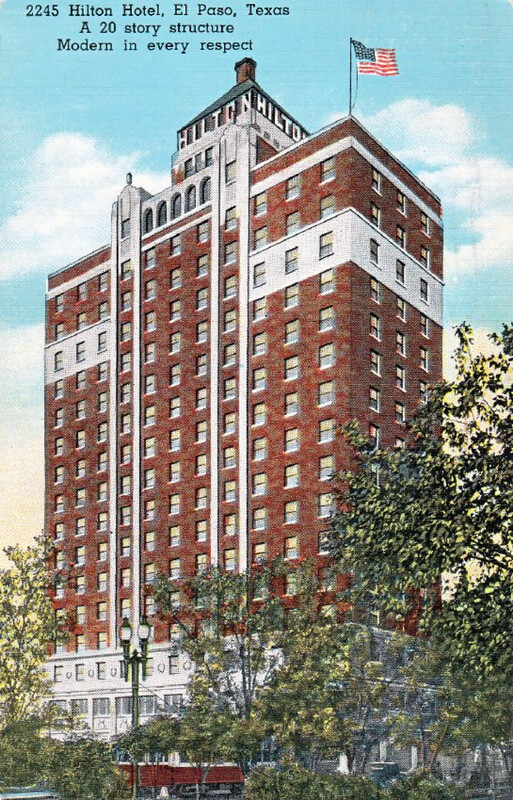 This postcard features the Hotel Hilton in 1941. On the front it says: "2245 Hilton Hotel, El Paso, Texas. A 20 story structure. Modern in every respect." It was sent on April 15, 1941. The building was designed by the famous architect Henry C. Trost and opened in 1930. It is a famous example of the Art Deco style popular in the 1920s. The seventeen story structure combined semi-modernistic lines with Indian designs. The tower was roofed with green terra cotta tile. The interior areas were luxury decorated and the rooms mirrored the state of the art, featuring fully electric lighting, ceiling fans, radios and private bathrooms. It served as one of El Paso's most luxurious hotels; even Elisabeth Taylor briefly lived here in 1950/51. In 1963 the Hilton Hotel company sold the building. It was re-named Plaza Hotel and operated until 1991. In front of the Hotel, the San Jacinto Plaza and a streetcar can be seen. can you reopen it one day? PLEASE?